Beaten egg is usually brushed on biscuits before baking to give them a shiny finish or to help sprinkled sugar stuck to the tops. If you need a great treat for tomorrow, you definitely need to make these Spooky Raisin Spiders. As I learned from the California Raisins blog, this treat costs just 40 cents per serving and has an equivalent to a serving of fruit! Place raisins, almond butter, honey, and cocoa powder in a food processor and process until a thick paste forms. 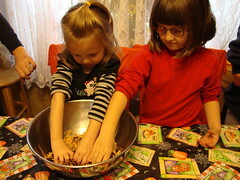 Transfer to a larger bowl and stir in cereal. Press mixture into 12 balls and press lightly onto a foil or wax paper lined baking sheet. 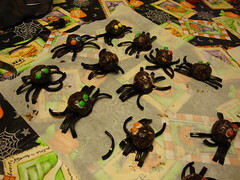 Spread a small amount of melted chocolate on the bottom of each ball and slide 8 small pieces of licorice under each to form the spider legs. Refrigerate until firm. Stir a few drops of water into powdered sugar to make a thick mixture to "glue" eyes onto the spiders.